Harvest ended with somewhat of a whimper in the Mosel. For me, straddling both vineyard and cellar, the end of picking simply meant more cellar work, less physically demanding but no less interesting. It’s a monumental achievement, though, when the last of the fruit comes in, especially in a year like 2013, which was in many respects a race against a steady, weather-induced loss of grapes from the vines. We celebrated en masse at a wonderful dinner hosted by Weingut Kerpen, with plenty of great estate wines and hearty German food. A few days later, I dined again with Martin Kerpen, this time at an astonishing restaurant in Zeltingen-Rachtig, a couple of kilometres from Wehlen. The Zeltinger Hof is somewhat legendary in the area, not least for its selection of well over a hundred and fifty wines by the glass. Bottles line the walls and represent a list that, I imagine, is unparalleled when it comes to wines of the region. It’s the kind of list people travel for and its context — a humble hotel restaurant in a small wine village — might strike some as unlikely. The travel journalist Jacob Strobel y Serra caused a minor sensation recently when he wrote scathingly of the Mosel as a backward-facing tourist destination, lacking the sorts of modern attractions demanded by today’s traveller. While this has stirred debate within the region, it has also prompted many restauranteurs to feature Moselochsen on their menus, Serra having accused the region’s inhabitants of an attitudinal similarity to the lumbering, narrowsighted Mosel ox. For me, a menu of schnitzel and Moselochsen sounds like a piece of heaven, and it’s true the Mosel seems free of the sort of ultra-high end tourism experiences that can, for better or worse, transform a region’s appeal. As such, it’s terribly easy to get a good, cheap meal at many of the villages that dot the river. At the Zeltinger Hof, Martin and I ordered a menu with Moselochsen at its centre, and the proprietor provided two wines to match. One was a Mosel Spätburgunder with considerably more structure than I’m accustomed to, the other was this Riesling from Wehlener Sonnenuhr, old but by no means ancient as wines of this region go. It amazes me how the Rieslings of the Mosel are used as food pairings locally. A plate of slow-cooked red meat with a rich, sweet jus cries out for a big red wine. Or does it? Of the two wines paired, the Riesling was by some considerable margin the more attractive match. The wine itself was excellent. 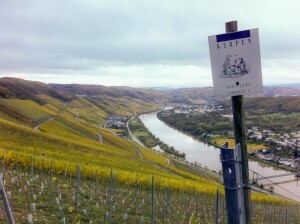 A curious thing happens to Mosel Riesling as it ages. Unlike, say, a Clare Riesling, whose flavours typically move through honey and toast, Mosel wines seem to deepen without such sudden, radical changes in flavour. This Auslese is caressingly gentle on the nose, with aromas of vanilla, lemon curd, butter and minerals. It perhaps lacks a degree of refinement, like a stuffed toy just starting to come apart at the seams, but one forgives older wines these flaws more easily than younger ones. In the mouth, it shows the slippery texture that graces older Mosel wines, a texture that strikes me as not unlike Hunter Semillon. It’s the mid-palate, though, that allows this wine to pair so well with rich, meaty food. There’s still good body and sweetness here, age adding richness to its flavours and matching its impact to the sweet jus of the Moselochsen. Good length, intensity and complexity. Again, this lacks the sort of precision and refinement of a truly superior Riesling, but in the context of this meal, it was nigh on perfect. The last two days have seen wonderful visits to Weingut Kerpen by friends of mine: Chris Thomas, winemaker at Dowie Doole in McLaren Vale, and Jimi Lienert, with whom I worked in New Zealand at Terra Sancta. On both occasions, Martin Kerpen generously opened many bottles for us to taste, so I enjoyed the good fortune of sampling a range of Kerpen wines from the last three decades. To single out one wine seems a little pointless, as the interest in such wide ranging tastings lies in understanding the diversity and flavour development within the style. However, I felt one wine above all others was dripping with beauty and quality — this 1995 Auslese ***. There’s a big jump between Spätlese to Auslese, and within the latter quality level a wide range of permissible ripeness levels. This wine, a three star Auslese, is at the top of the ripeness scale, a fact abundantly evident in the richness and power of its flavours. It simply screams from the glass, not in the strident manner of a young, dry Riesling, but in the buxom style of a deeply fruited wine, layers of rich fruit aroma emerging from the glass. There’s a good deal of flavour development, but this doesn’t read as an especially old wine; rather, its primary fruit smells burnished, high toned edges having been replaced with golden, glowing hues. In the mouth, an exceptionally long wine. This is probably carrying a ridiculously high level of residual sugar (by Australian Riesling standards, anyway) but it’s taut and clean, balancing powerful fruit at the front of the palate with refreshing, fine acid at the rear. What one gets at these higher ripeness levels is more power and complexity, and this seems to me quite remarkable for the amount of fruit that is packed into what never seems an especially sweet or dessert-like wine. Line and length are impeccable, as is balance, so critical with this style. On the basis of tasting much older wines from this estate and vineyard, I’m sure many more years could accrue without detriment, but I think it’s fabulous right now. I hope Martin will sell me some from his cellar.